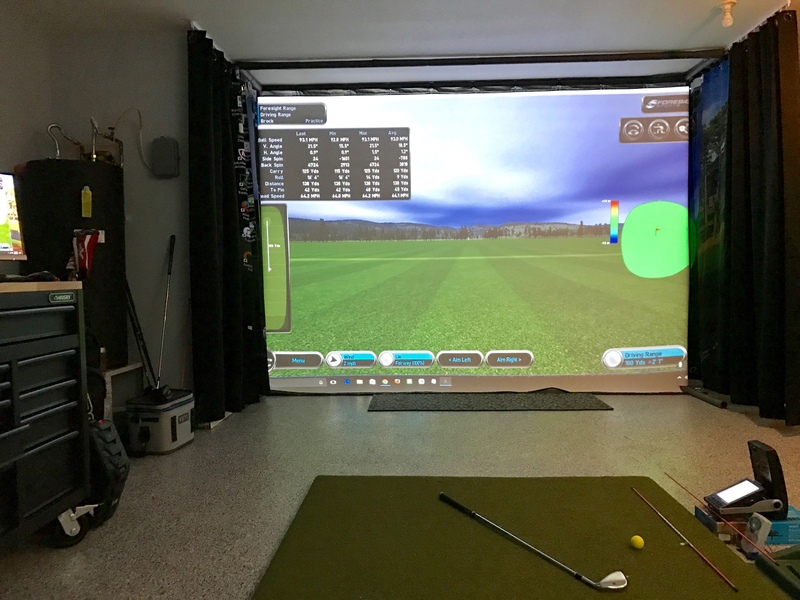 Post pictures of your Protee golf simulator room or setup. I thought I would post a pic of my Simulator. It's a little different that others, but works in the space I had. Very clean setup. Looks great. Is that a 4K projector? Have not been here in a while, been building this. Still a little bit more to go but almost done. Wow! I am brand new and didn't realize simulators could be a home based thing! This thread is fantastic... got me dreaming. Some great looking sims there! First of, this forum is awsome! All you guys building your own sims are amazing. My journey started with a cheap net and hitting mat and has evolved to a garage sim with r-motion TGC simulator. I'm a medium to high handicapper (HCP 23) and just became a father in may so I dont have the time to golf as much, I wanted to hit some golfballs in my backyard. After I found this forum just browsing the internet for home-golf setups i took the plunge to try building my own sim. My setup is a really low-budget golf sim thats in the making. I'll post some more high res pictures when I'm up and running. I haven't really got the chance to try out my sim yet. Last edited by G4zzel; 08-29-2017, 07:25 AM. As an update to this post I did in 2017. Now at the end of summer season here in Sweden I Have progressed amazingly on the turf! This year i broke 90! Never Done that before. My HCP is down to 16 and I’ve never played better. Finally got my sim basement up and running. Couldn't be happier. Last edited by jcolton31; 08-30-2017, 01:12 PM. Nice! Where did you find the mini-bag? Made some improvements to the above system, I added a receiver and a surround sound system to hookup to the laptop. I run the Xfinity app and we now can watch movies in HD surround sound. I can now switch between the upper TV and the big screen, this past weekend we hit into the football game and played the sim on the TV, was fun. Oh yeah also had to add this to the side of my enclosure!!! Quick pic of mine in my garage. Cannot wait to build out a better system in a different house at some point. But I am actually very happy with this setup. I need to figure out a solution for putting as it is not great dropping off the CCE mat onto the cement. Takes all of 2-3 minutes to put everything away so I can park my cars in the garage. Awesome garage setup, didn't you do a video on you tube awhile back? V2.0 of my sim room: new screen (raw mill), new projector GT1080darbee, new side panels (cut carpet runner). 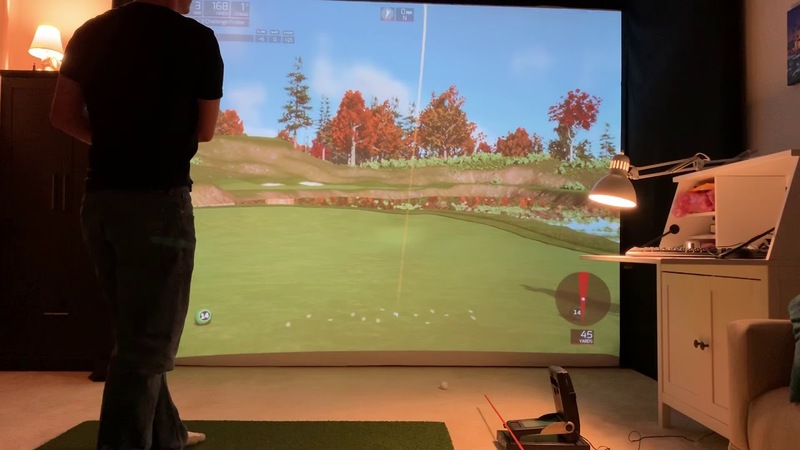 I still want to add ceiling baffles and cut the carpet out for a dedicated golf turf setup from hitting position to the screen, but I’m hesitant until I find the perfect solution. it looks awesome and stops flop shots dead. Will post a pic when back. Last edited by vrpunk; 12-31-2018, 06:20 PM.